Pekanbaru is the capital city of Riau province in Sumatra Island. Lands along the side of Siak River, this city is known as a Port City. 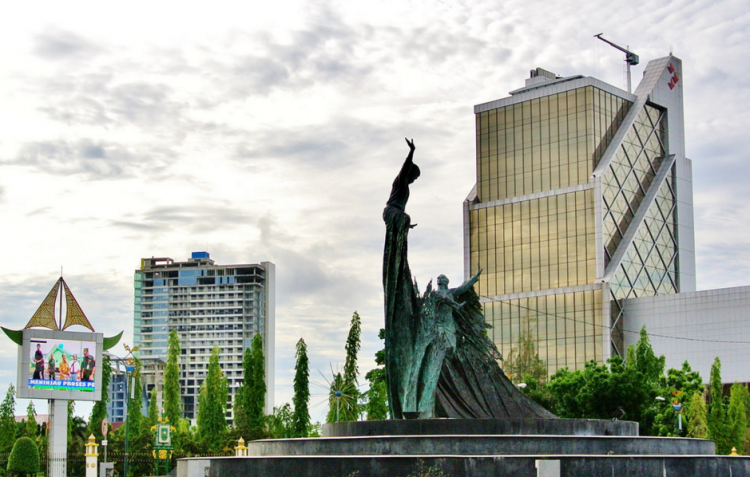 Pekanbaru is also well known as the capital city of Petroleum in Indonesia. Besides, people also remembered Pekanbaru as one of the biggest palm oil city in Indonesia. No wonder this city becomes rapidly growing bigger than the other cities in Sumatra. That is why mostly people define Pekanbaru as a business travel destination, despite tourism. Mostly travelers from another country only visit Pekanbaru as a transit or stop by city before they visit another tourism destinations in Sumatra Island. Here are the facts you have to know. Pekanbaru is not only open for business or commercial visits. This city actually has various tourism destinations. You can find a lot of cultural and historical sites that built in unique architecture with the taste of Malay culture. You may also find some great natural tourism objects, where one of them is being globally popular by its unique and rare phenomenon (yes, we are talking about Kampar River!). And speaking of the food, Pekanbaru surely satisfies your appetite by its culinary richness. For those saying Pekanbaru is only open for business or commercial visit, gladly shocked yourself by checking out these top 11 tourist spots in this city. 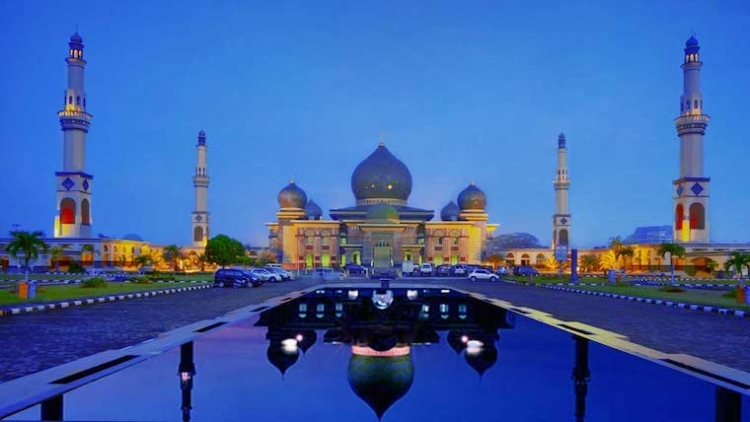 The religious site that located at the city center is one of the grandest mosques in Indonesia. The size of the mosque can accommodate up to 4500 worshippers. The mosque glimpse may remind us with Taj Mahal in India. But when you look closer, you can find various influences of architectural styles, such as Malay, Arabic, Turkish, and India. The mosque consists of three floors, comprising many facilities, in addition to the worship place. This mosque has halls, meeting rooms, libraries, and education services. This is the largest library in the island and also one of the finest landmarks in Pekanbaru. Perpustakaan Soeman HS may pamper the book lovers, as well as the architectural observers. This library stores plenty collections of books, with the highlights literature related to Malay culture and energy corner (Chevron Library). Set also as a public place for the community, Soeman HS Library is the place where you can read the books all day long, holding a meeting, stay connected at the Internet room, or just having fun with friends in Cafeteria. For those admiring the art of architectural, Soeman HS Library has a unique look. The design is inspired by the plinth read Al-Quran glimpse that also similar to the form of opened book. Find this gorgeous library at Jalan Cut Nyak Dien, Pekanbaru. 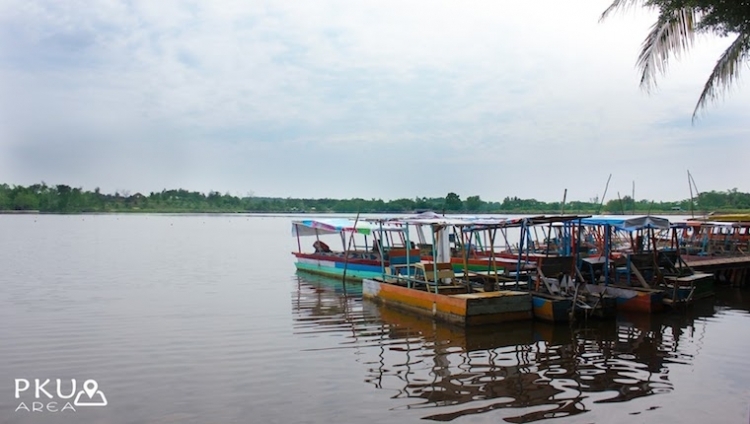 Kampar River is the icon of tourism in Riau. This river is really popular among the surfer in the world. For those wondering to find the connection between "surfer" and "river", that's the beauty of this river. 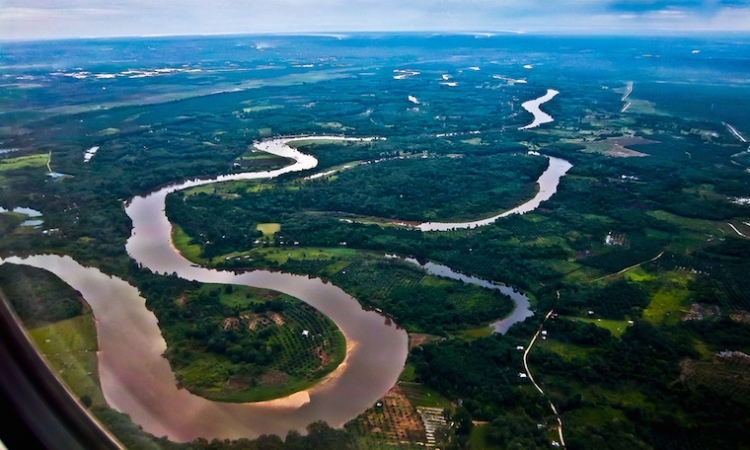 Sungai River is there in Meranti Bay, Pelalawan Regency - Riau. This is not the ordinary river since it has tidal bore. A tidal bore is a phenomenon of hydrodynamic movement that appears as a high tide on the water surface with destructive strength. There are only 80 tidal bores in the world, and Indonesia only has one in Kampar. The most appealing is that Kampar's tidal bore is called Bono. Bono is locally believed as the face of 7 ghosts that remained inside the river. With the uniqueness of natural phenomenon, Kampar River is must visit place for you to experience the magical big waves on the river up close. It's only takes 1,5 hours driving from Pekanbaru. Pasar Bawah is a tourism market and also Pecinan in Pekanbaru. It is situated by the side of Siak River. All tourists always visit the oldest market to shopping spree. Pasar Bawah is filled with shops that sell antiques, souvenirs, household tools, local crafts, and local foods. Make sure you buy the souvenir for your family in Pasar Bawah! It offers very cheaply yet in good quality! Situated on Siak Regency, this palace is the must visit historical sites in Pekanbaru. Istana Siak Sri Indrapura was built marrying the style of Arabic, Malay, and European architecture. This palace originally used as a residence of Sultan Siak. Nowadays, Siak Sri Indrapura Palace is being the top destination where the tourist can reminisce the greatness and the glory of royal past. Walk inside the building will brings you back to the old past. The interior of the palace still decorated like the old times. There are photographs, antique furniture, big mirrors, hundred years old ceramics, musical instrument, wardrobes, life tools, and much more. The staff will glad to guide you touring the palace. Danau Bandar Khayangan Lembah Sari is man made lake (irrigation dam) that located about 10 km from city center. This is the alternative for those seeking a natural getaway in Pekanbaru. Widely spread about 16 hectares, this lake is surrounded by greenery. We can enjoy the sight from the small cottage by the side of the lake. You can also sightsee and strolling on the small tracks that lines around the lake. Danau Bandar Khayangan Lembah Sari also good for a picnic. You can sail around the lake with a paddleboat that accommodates 2 people too. Kindly visit this lake on the anniversary of Pekanbaru, where the Festival Danau Bandar Khayangan is held with various agenda, such as paddling boat race, and food bazaar. Located at Jalan Sudirman (Arena Purna MTQ/Kompleks Bandar Serai Ali Haji), Idrus Tintin Arts Hall is a landmark and iconic building that will spoil you with some great big events in Pekanbaru. Art exhibitions and festivals, concerts, theatrical performances, and cultural show rehearsals are often held in this place. As an art hall, Idrus Tintin was built artistically inspired by Malay - Riau cultural wisdom. It looks so majestic with some traditional house of Riau surrounded the building. Inside this hall, there's Dekransada (Dewan Kerajinan Nasional Daerah) as a non-profit organization that provides information and local craft center. This is the right place for you to find a lot of genuinely local crafts and arts of Riau, such as Melayu wardrobe, Riau batik, songket, and kain tenun (woven fabric). This one is very suitable for family recreation. Riau Fantasi consists of themepark and waterpark. Built on 6.5 hectares area, the waterpark may become the largest in the city with various slides that really thrilling but tempting. The themepark also offers numerous rides that really challenging and fun. Riau Fantasi is the must visit place to having fun with friends and/or family. This completed recreation spot is located on Jalan Labersa - Parit Indah. It takes 10 minutes drive from the airport and 20 minutes drive from the city center. Here is the right place if you want to enjoy the real culinary experience in Pekanbaru. You can find plenty food stalls and restaurants along this road. Don't miss the chance to taste the Durian (tropical fruit with the unique scent), which sold on Pondok Durian that spreads along Sudirman Street. This is the one and only spots to eat durian all day all year. Local people usually eat the durian with sticky rice, which called "ketan lemang". It's sweets, scented, and addicted! Moreover, Sudirman Street also houses some great local restaurant where you can sample Malayan food, Minang Food, even Javanese, Sundanese, and Chinese food. Since Pekanbaru is known as a port city, no doubt this city serves the great and fresh seafood that may found inside the menu on mostly restaurant. 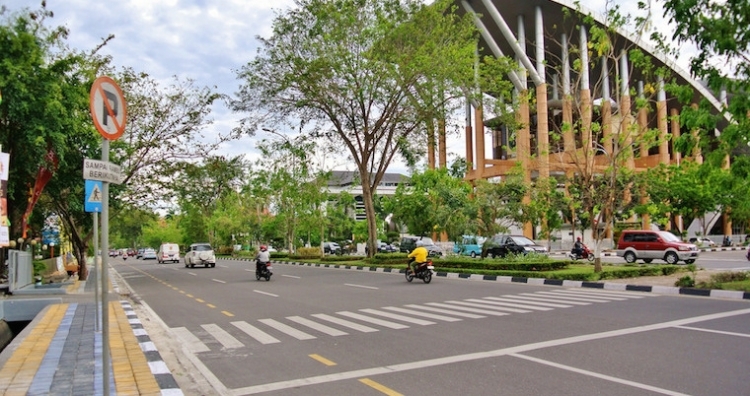 The mall that sits on the intersection of Jalan Sudirman and Jalan Teuku Umar is considered as one of the pioneering modern shopping mall in Pekanbaru. This modern mall also has the highest tourist' visit compare to other malls in town, since its location at Jalan Sudirman. Some popular brand available inside, such as Gramedia, KFC, Ikan Bakar Cianjur, and Solaria. There’s also handphone center, department store, and night club in here! This is the most popular breakfast spot for tourist who visit Pekanbaru. This coffee shop is always full of people every morning. Located on Jalan Senapelan 22, this legendary coffee shop offers the best local coffee, also various tasty menu to satisfied your stomach at the beginning of the day. Some menu available are soup, soto, noodles, fried rice, and dim sum. But remember, always couple the black coffee with the kaya toast for authentic experience at Kimteng! So, it's already proven that Pekanbaru is worth to be your holiday destination. You may now fly to Pekanbaru for having fun, not only for stopping by. After wandering around the port city, complete your trip with the best rest you can have in Pekanbaru. 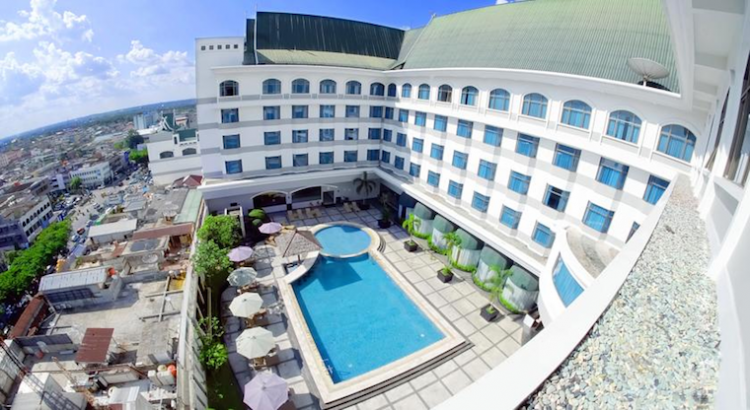 One of the best places to stay conveniently in Pekanbaru is surely on its 5-star hotel. Jatra Hotel Group presents Grand Jatra Hotel Pekanbaru in Jalan Sudirman, adjacent to Mall Pekanbaru. This hotel looks splendid with modern art deco inspired design. Grand Jatra Hotel offers 200 comfy bedrooms that supported with high-class modern amenities. You will happily soothe yourself on its rooftop pool and savor your appetite on its first class restaurant.